I used 4* 0.7mm silver plated wires as earth ties through the board at the MGA86576, 2 on each of the earth pins on the device, and the same wire for the earths on the dielectric filter. I have seen no instability. The beacon was about 6dB above the noise floor at 54,400 km with a squint of 21 deg on orbit 331, using a 60cm offset dish and my PCR1000 receiver. Screenshot at 43,303 Km with 12 deg squint showing AO40RCV waterfall, TalkPCR controlling the PCR1000, and LogSat in the background ( 200Kb image ) the S meter shows about 4.5, the meter shows about S 1.5 with no signal. My first aerial ( antenna for those over the pond ) for AO40 mode S was a long helix. The helix is constructed from 21 turns of 2mm dia copper wire, spaced approx 26mm wound clockwise on a 1 metre length of 40mm external diameter plastic waste pipe from my local DIY store. The matching section is the first ¼ turn spaced 8mm from the 105mm square reflector. I don't have anything to check matching or VSWR at these frequencies, so it's just copying information seen on the AMSAT-BB. 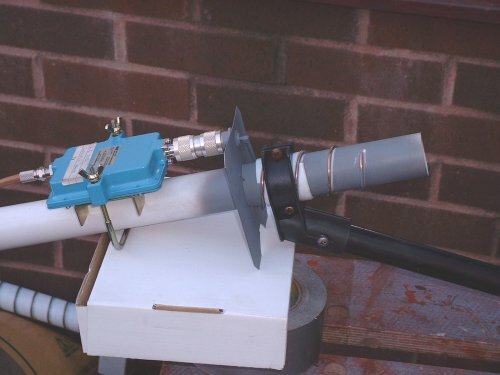 The output coupling N connector is positioned so that it is the correct distance from the tube to screw directly onto the Drake 2880 when mounted on the tube with its standard mast clamp. The reflector has a 40mm hole in the center, and is held in place by 2 wires at right angles that pass through the tube and is soldered to the reflector, again no claim for originality, just cribbed from other peoples ideas. A plastic box was fastened to the reflector with Silicon Rubber ( RTV?) for weather proofing. 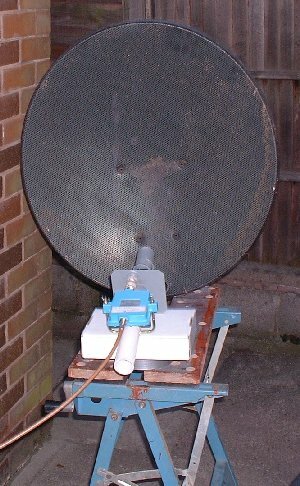 This is a standard SKY TV alloy 60cm offset dish. They can be picked up very cheaply or even free. 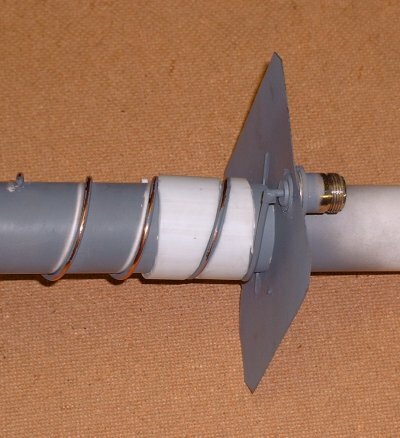 The feed is a 4 turn LEFT HAND helix, wound again with 2mm dia wire, and once again matched with the first ¼ turn spaced about 8mm from the reflector, this time wound on 36mm external diameter plastic waste pipe. 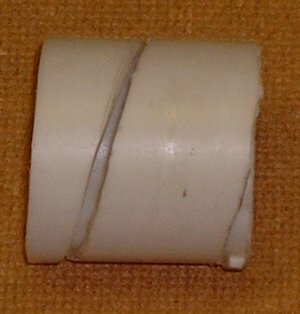 As a point of interest, the 36mm pipe is an EXACT sliding fit inside the 40mm pipe. The standard LNB mounting clamp has a 40 mm hole, and the 40mm pipe is a nice tight clamped fit into it. I took a 30mm length of the 40mm pipe, melted a helical slot into it with my soldering iron ( messy ), cleaned it up with a Stanley knife, it then fits tightly over the helix on the 36mm pipe, and provides a good mounting point for the standard LNB clamp. 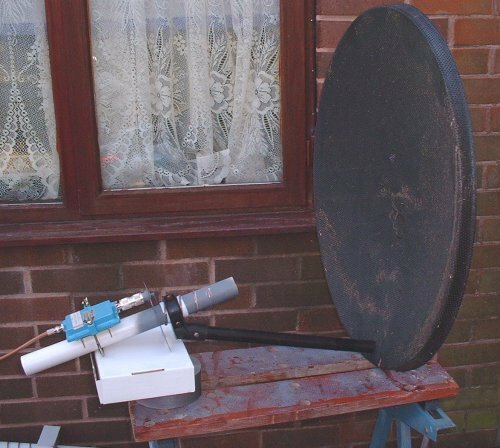 I have found by experiment that the focal point of the dish appears to be just inside the standard LNB clamp, there is actually a ridge in the front edge of it, and a ring on a standard LNB, so I assume that is the focal point, it certainly seems so by measurement. The actual position for the helical feed is with the reflector about 1 turn behind the focal point, but this does not seem critical, certainly no discernable difference moving it 10mm each way. The dish is a black perforated 60cm aluminium alloy dish, so the marks on the photo's are dirt not rust! All supported by my trusty Black and Decker Workmate. Taken whilst receiving AO40 on orbit 331. In position on the dish. Just the helix and reflector on 36mm tube. The mounting sleeve on the helix. The feed ready to be fastened to the dish mounting arm. All I need now is some uplink capability!